The brand new rock musical ‘Oxy And The Morons’ that was written by Mike Peters, Steve Allan Jones and Paul Sirett and currently staging at the New Wolsey Theatre in Ipswich, has been playing to standing ovations and excellent reviews from all quarters including a glowing piece in the British Theatre industry’s most prestigious periodical The Stage. Following the final night of the UK tour at Oxford O2 Academy, Mike & Jules Peters will be in attendance for the closing performance of ‘Oxy and The Morons’ on Saturday 21st October to celebrate the success with director Peter Rowe and actors Rob Jarvis and Mark Newnham, who play Andy / Oxy alongside an absolutely superb cast and crew. Alarm fans who want to try and catch the final performance can get tickets here. The all out positive reaction to the musical has been such that there are high hopes for Oxy and The Morons to tour other UK theatres at some point in the future. In the late 1970s, punk band Oxy and the Morons nearly made it, coming within a pen-stroke of signing with record label EMI, before they split up in an angry, acrimonious mess of misunderstanding and musical differences. In 2017, after being diagnosed with leukaemia, frontman Andy – aka Oxy – wants to put the band back together for one last gig. 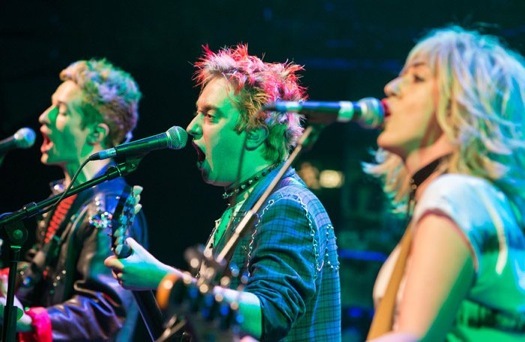 Collaborating with writer and lyricist Paul Sirett, Mike Peters and Steve Allan Jones have drawn upon their own experiences with Welsh band The Alarm to create this new musical, and the result is a time-hopping tale of four punk rockers, who appear as both their youthful, hedonistic deviants and their faded, present-day selves. It’s like Rock Follies written by Joe Strummer. The neatly plotted narrative lays it on quite thick, with break-ups, make-ups and booze problems at every turn, but it’s structurally daring – looking back from 2017 in the first half, then forward from 1978 in the second – and the writing, woven with an unexpectedly downbeat wit, manages to evoke an amenable, Brit-flick charm throughout. New Wolsey artistic director Peter Rowe’s production is swift, slick, and sparse, with scene-shifting musical numbers, running the gamut from raucous punk to slightly more raucous punk, performed live on a rolling bandstand. His cast is excellent too, particularly Rob Jarvis’ present-day Andy, a shambling Scouser stuck in the past. With the help of the multi-talented Morons, Jarvis shepherds this warm-hearted paean to punk towards its life-affirming ending.